Finishing strong is a quality great salespeople possess; they know what strings to pull when it counts and what’s between them and hitting the mark. Put the cutesy sales stuff on hold and be direct with your prospects. Never compromise your professionalism, because the world will continue to spin and your reputation will stick with you after the quarter ends, but be clear with people and generally they’ll respond positively to that candor. Is the prospect looking for conditions you can leverage for a signature in the short term? What kinds of hurdles can you help them clear so you can clear your own? This will also help you determine how far you have to go and whether it’s worth the effort to land that prospect or you should focus on opportunities that might be closer to the finish line. That big opportunity you’ve been working on? The one that you always seem to be progressing but just hasn’t seemed to turn the corner for some reason? That if you land it, you’ll have almost completely made your goal? Forget it. At least for now. There still may be an opportunity for that deal, but that’s next quarter’s work. The next few days are about closing what’s within reach, and wasting time on wishful-thinking scenarios will likely leave you high and dry and with nothing to show for it. Of course, each opportunity is different and each sales person has their own feel for a situation, so if you can close the deal, close it! But beware of those pipe-dream scenarios that are all bark and no bite. I don’t need to tell you this, but you can’t add any more hours to the day, so effective prioritizing is a must. Making your time count is the name of the game, and if you do it well you can maximize wins with the time you have. It starts with objectively assessing what’s in the pipeline and what you can close now. If you’re already over those pipeline pipe-dreams, structure what you have left to best use your time and energy. Can you leverage time zones or other conditions affecting your prospects to your advantage? Are there things you can do outside of normal business hours that will free up some time during the day? Even things like what you eat and how you operate can make a difference when you’re maximizing output. If can take actions as small as spending a few minutes before bed making a salad for lunch the next day, the time you save on getting takeout or walking to the store might be worthwhile. Even the best laid plans must be adapted, and whether or not you can adjust in real time is a game-breaker. That doesn’t mean you need to deviate from your approach, but be prepared to shuffle things around or make sacrifices when necessary. The end of the quarter is usually busy for everyone, especially if you’re in B2B, so anticipate twists and try to turn them into sweet music whenever possible. The same is true in poker as in sales — you don’t want to put all your cards on the table right away. But good players know how and when to play their cards, and don’t go down with a good one up their sleeve. Have an executive that could place a call to push that potential deal? Is there an engineer or subject matter expert you could tap into to add some meat to your pitch? Been saving some sweeteners or conditions just in case? Now might be the time to play that card if you have it. Obviously this depends on how you assess your prospects and their worth, but if the opportunity presents itself, make a play and let the chips fall where they may. Closing out a sales quarter brings into focus many big challenges of being in sales, which is why closing with a vengeance is as much about mindset and attitude as anything else. If you focus, plan and play your cards right (with a little improvisation when needed), you have a good chance of coming out with that winning outcome you’re after. 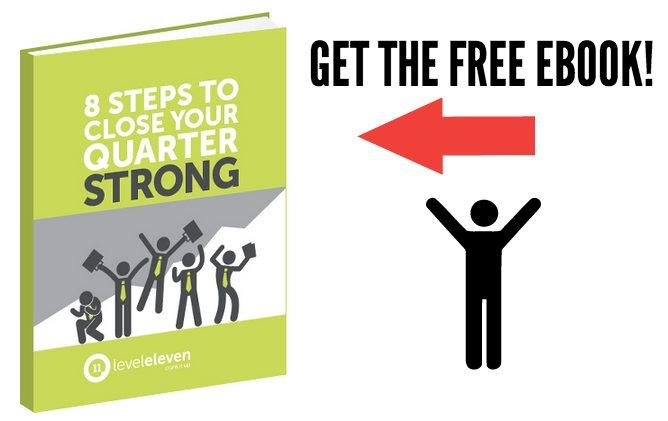 Use these tips with our eBook 8 Steps to Close Your Quarter Strong for maximum effect! The end of the sales quarter is closing in and one of two things will happen: Win or Lose. Here are 5 tips for closing out with a vengeance!